With contributions from both established and emerging feminist historians, Gendering Colonial India will be an indispensible read for students and scholars of modern Indian history, colonialism, nationalism, gender studies and popular culture. Categories: Education, Gender, Orient BlackSwan, Publisher, Reference, Sociology and Anthropology, Women's Studies. Tags: 9788125047643, Caste in India, Charu Gupta, Colonialism, Communalism and Women, Gender studies, Indian history. 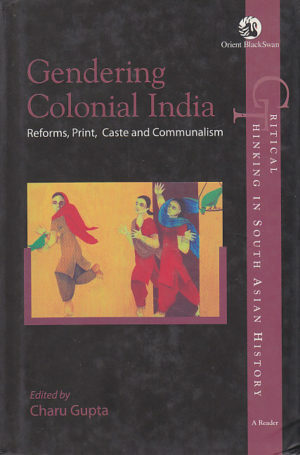 Drawing on contemporary critical theories and academic debates, Gendering Colonial India examines how notions of patriarchy were recast and challenged in colonial India between the early nineteenth and the first half of twentieth centuries. This definitive collection of essays analyses the close interaction between gender, caste and community identities. Gendering Colonial India brings out various regional complexities and lively public debates on social reforms for women and their impact on issues like sati, widow remarriage, domesticity, sexuality and education. It shows how women emerged as both objects and subjects of popular discourse and discussions. Simultaneously, the essays engage with concerns around masculinity, inter-caste intimacies and communal identities. The debates found multifaceted expression in an emerging dynamic popular-public sphere and also in a flourishing vernacular print culture. These in turn served as powerful tools for propagating dominant ideas about women and for fashioning national, regional and community identities. The three primary texts translated by J. Devika, Anshu Malhotra and Charu Gupta bring out the relationship, most often fraught, between popular literature, reforms and women.